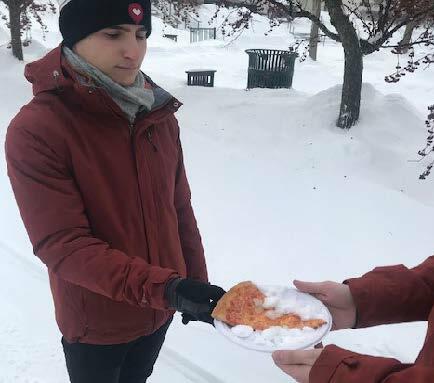 Zachary Nislick ’19 delivering warm pizza with snow on it. Photo by Andrew Wojtowicz. Disclaimer: the articles within this section (pages 10 – 11) are satirical, and meant to be a humorous and exaggerated expression of perspectives of campus culture for entertainment purposes. These articles are not necessarily intended to reflect the truth, offend readers or stoke controversy. Union’s recently refurbished Reamer Campus Center has introduced students to a brand new deli, pizza parlor and an upper-to-go soft-serve ice cream shop that also sells vegetables. But among all the changes made to the school’s most popular dining court, the most anticipated has undoubtedly been the delivery service offered by the Garlic Nott pizza parlor. Instead of hiring internally for the position, Union Hospitality (UCH) decided to open up the job posting to the public to attract the best delivery talent out there. With a week to go before the start of the term, UCH narrowed its search down to three promising candidates, each with a unique background fit for a long-term role at Schenectady’s state-of-the-art pizza joint. The most educated candidate is a recent graduate from the business communications school at Yale University, Samuel Wong, who immediately submitted his resume in pursuit of valuable start-up experience. “This seemed like a perfect opportunity for me,” Wong explained. “Fresh out of graduate school, I want to gain experience at a cool start-up company like the Garlic Nott.” Even though Wong’s credentials seem to over qualify him for a position like this, he sees it as a chance to get his foot in the door. “That’s how you rise up in the start-up world… you start out as a delivery boy and next thing you know, you’re CEO of the company. It’s all about making connections.” The ambitious 26 year old certainly impressed UCH job recruiters with his internship experience at several firms in the Northeast, which would serve him well as he greets students at their doors to deliver lukewarm food to them. Another well qualified candidate for the Garlic Nott delivery guy is Chuck Humphries, who has nearly 10 years of delivery experience split equally at both Dominos and Luca’s restaurants. Humphries proved to be an enticing applicant when he claimed ownership of a tan 1984 Toyota Supra, and he never broke eye-contact once during his interview. Humphries, a Schenectady native, spent plenty of time biking through Union’s campus growing up, so he has an advantage of being very familiar with the various dorms and housing complexes. The third candidate is overeager Union student, Jessica Wright ’21, who saw the job posting on Handshake and figured it could be a good resume boost for her. Jessica is already a member of seven different campus clubs and organizations, but one thing she noticed her resume lacking was real work experience. After several weeks spent at the Becker Career Center polishing her resume, customizing cover letters and participating in mock interviews, Jessica felt well prepared to go for it. “The interview went fairly well,” Cole said. “Her answers felt somewhat rehearsed, but she was the only candidate to submit a cover letter so I couldn’t help but be impressed.” One of Jessica’s stronger points in her cover letter was that her being gluten-free would help her refrain from eating the pizzas or garlic knots she delivers. At the end of the interview process, UCH chose the third candidate after realizing they can just pay her well under minimum wage and then rename it a work study.